My story was up on the Forks Over Knives website for a week and received 2800 likes! I couldn’t believe the awesome response. In February my Dad encouraged my husband and I to watch “Forks Over Knives. Before it was over we were convinced of the benefits of a whole-food, plant-based diet. Since that night our lives have changed completely. We haven’t had meat, dairy, eggs, or oil since — and the results have been amazing! The “Engine 2 Diet” by Rip Esselstyn, and Dr. Fuhrman’s “Eat to Live” helped us with the basics as we got started. My cardio has been INSANE — I’m running and biking like I did 20 years ago. I did two hours of cardio yesterday just because it felt so good! I wrote a letter to the editor of a wonderful new magazine “Vegan Health and Fitness” (http://www.veganhealthandfitnessmag.com/) and she invited me to submit photos for their model search! 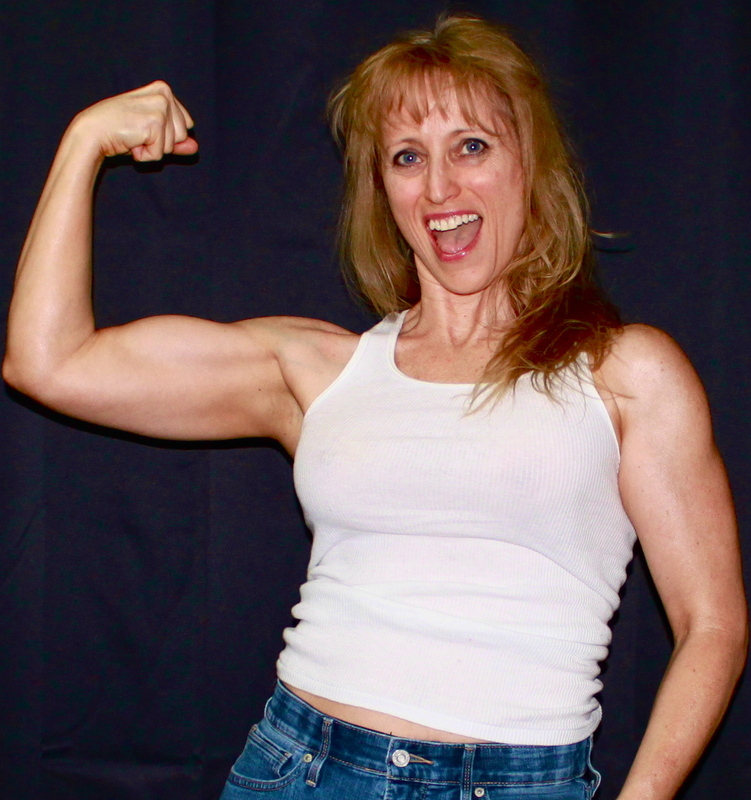 So at 49 years old, I went from unhealthy and overweight to burgeoning fitness model. One of the most satisfying things has been seeing our kids eating more and more healthy foods. They’ve developed a taste for fruits and vegetables and even enjoy things like lentil soup! How great to be able to pass this information to them while they are young and know they will be healthier because of it for the rest of their lives! I’ve only been Vegan for 6 months, but I swear the Vegans I have met so far are some of the sweetest people on the planet! When I ordered my Vegan Bodybuilding t-shirt to celebrate my Vegan Fit self, this is what else I got. 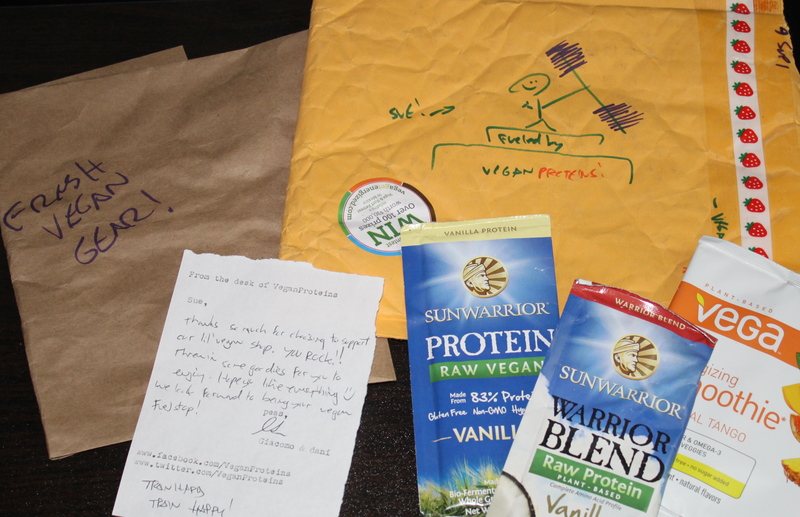 Personal note, multi-colored drawings on the envelope (yep that’s me on the pedestal), and some free nutritional samples. Ready for a forum full of vegan athletes, solid advice and inspirational journals?? You have to check out http://www.veganbodybuilding.com/forum/. 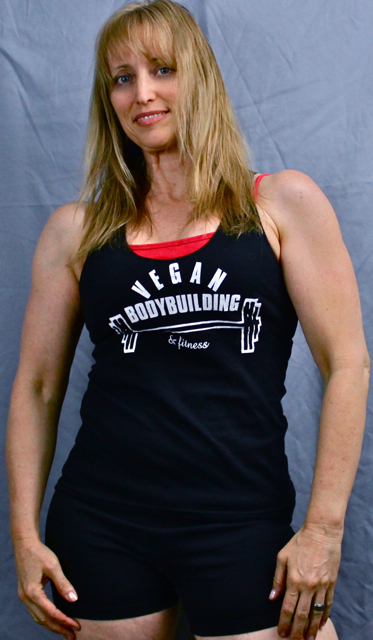 It’s a part of http://www.veganbodybuilding.com which has tons of info, videos and profiles of successful vegan athletes. The site and forum were started by Robert Cheeke, the guy who wrote the book on vegan fitness literally “Vegan Bodybuilding and Fitness” by Robert Cheeke. Pass on the word and let’s help grow the subscriber base for a brand new VEGAN Health and Fitness Magazine! Plant Powered Woman Takes Off!! Can one woman get ripped and ridiculously muscular on a plant-based, whole food, nutrition dense diet? Hello and welcome to my blog! 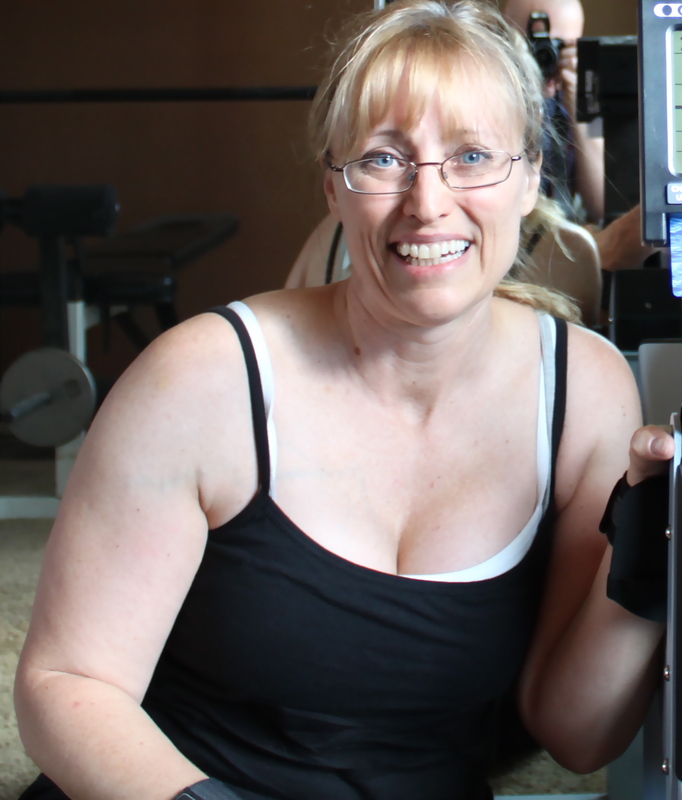 This blog will follow my journey as a 49 year old woman on a journey to better health and ripped abs. It is, my friend. I am not the first woman to do this and I certainly won’t be the last. Many female pioneers have hit the stage in bodybuilding and figure competitions, running marathons, playing in sports; powered 100% only by plants. Many of their journeys have been featured on veganbodybuilding.com, PETA or other websites. This blog will document my fun and foibles as I learn about plant-based, whole foods nutrition, kill it in the gym and get ripped and muscular. Is it possible?! It IS! !